Are you wondering how to protect your hands this winter? I can really start to feel the cold in the air when I go outside. We had some unseasonably warm temperatures over the past few weeks, and I hoped that meant that winter was a ways off. But, it’s started to really cool down so I know that colder weather will be here soon. As pretty as the snow and ice are from inside, the cold weather can really be damaging to your skin. I received product for this post. This post contains affiliate links, and I will receive compensation if you make a purchase after clicking on my links. Your hands are used just about every waking second of the day. You use them to work, to play, and to show affection. They’re important. During the winter months, your hands can become dry, chapped, and raw. The cold dry air, exposure to moisture, and other harsh conditions really take their toll. The following tips and ideas can help you protect your hands this winter. Gloves help protect your hands from exposure. They keep the moisture out and the heat in. There are of course different gloves to consider for different occasions. There are gloves for driving, riding your bike, playing in the snow and fashionable gloves to keep your hands warm. Gloves can be made from wool, leather, cotton, and synthetic materials. Look for a good quality pair of winter gloves to keep your hands warm and soft. One fantastic way to moisturize your hands is to slather them with thick hand lotion and to wear gloves at night. They make moisturizer gloves specifically for this reason. They’re not your traditional leather or wool gloves. They’re usually soft cotton gloves that are easy to wear and easy to wash. Carry hand lotion with you and get in the habit of applying it often. Look for lotions with ceramides to help repair dry skin. Ceramides, naturally present in healthy skin, are vital to maintaining the moisture barrier. When ceramides are lost, skin becomes dry and damaged. 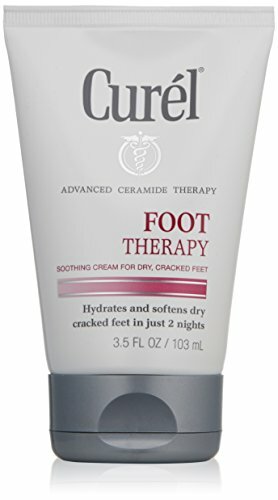 Curel Ultra Healing Intensive Lotion for extra-dry, tight skin helps repair extra-dry skin 2x better. It helps repair the moisture barrier with advanced ceramide complex. Plus, it’s dermatologist recommended. Paraffin wax treatments are used by many professionals who are prone to dry and cracked hands. For example, nurses wash their hands hundreds of times each day. It’s difficult to be a nurse and have soft hands. You can head to the spa to have a treatment, or you can buy a home paraffin wax station. It melts the wax. You dip your hand in the warm wax and slip your hand into a glove or baggie. Let the wax harden on your hand. Peel the wax off and you’re left with softer hands. You can also moisturize your hands before you dip them in the wax for added benefit. Many products are drying. For example, if you wash your face with benzoyl peroxide or salicylic acid, you are exposing your hands to these ingredients. They’re drying and can chap or irritate your hands. Dish soap can be drying too. Make sure the soaps and other cleansers you come into contact with on a regular basis are gentle on your hands. It’s important to take care of your hands. When they’re raw and chapped it affects almost every area of your life. Now that you know how to protect your hands, ake care of them this winter and they’ll take care of you all through the year. Thanks for the good advice. My hands dry out all year round but especially in the winter. I’ve been wearing winter gloves, mittens and using lotion. I hope it helps this year. As I forget to use lotion sometimes.